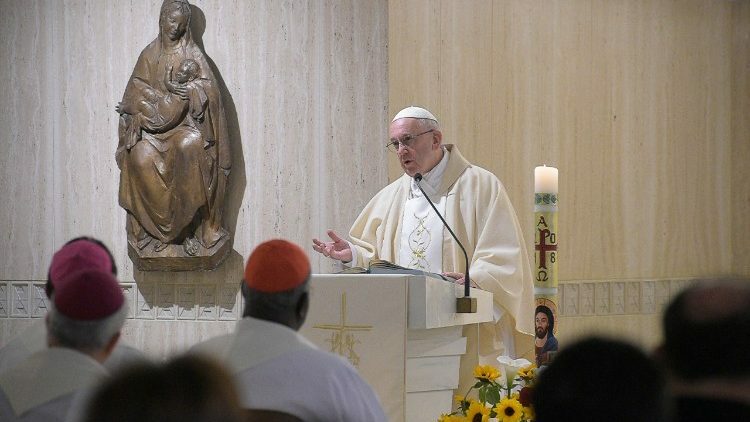 ‘Without love the Church cannot move or grow’ In his homily at Mass in the Casa Santa Marta on Thursday morning, Pope Francis recalls the Last Supper, in which Jesus teaches love in the Eucharist and service in the washing of the feet. Pope Francis said Jesus makes two “institutional gestures” at the Last Supper. Jesus, he said, gives his body to eat and his blood to drink in the Eucharist. He also washes the disciples’ feet. “These two actions reveal two commandments that will make the Church grow, if we are faithful,” he said. The second commandment, Pope Francis continued, is borne out in the washing of the feet: “serve one another”. Pope Francis said the third lesson is a warning. “You can serve, but only I send you and give you a mandate. You are not greater than I.” The Holy Father said this is true and simple humility. At the end of the day’s Gospel, Jesus warns his disciples that there is one among them who will betray him. So, Pope Francis concluded with an invitation to take a moment of silence to allow the Lord to look at us.